Sleek and reliable product. This is our third time ordering and we always have a great experience. Highly recommend this company. Great company to work with. They are the best of the best. Really appreciate how committed they are to making the customer happy. Very excited that I placed my first bulk order with Custom Earth Promos. Thank again. I loved this tumbler. They look amazing with our slogan branded on them, and we are contributing to a "going green" cause. Bought these tumblers in bulk for my employees and they were a huge hit! Everyone loved the "go green" aspect and how they marketed our companies logo perfectly! Will definitely be ordering more in the future! I like the printing space on these bottles, it really adds uniqueness. I customized several thousand and they have been a huge success. Very classy look to these eco-friendly tumblers. I think everyone that gets one of these tumblers has been pretty excited. They look amazing with our slogan branded on them, and we are contributing to a "going green" cause. 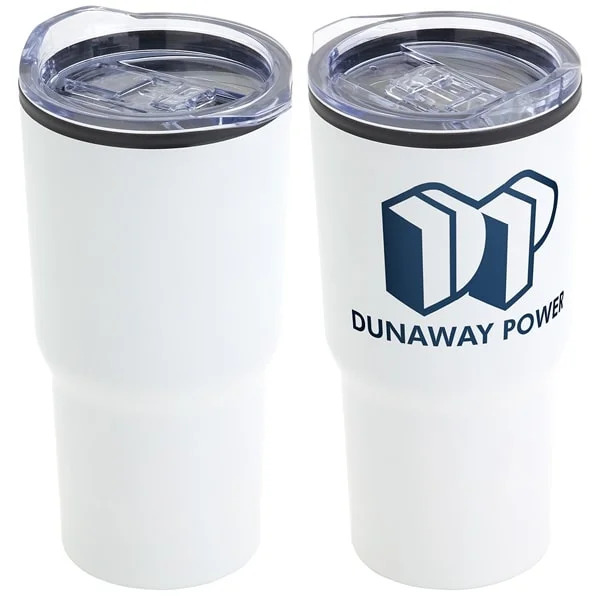 A very strong durable tumbler that stands up to a lot of wear and tear. Such an easy steel tumbler to clean, I'm glad that's the case, since I use it for everything. Being that these tumblers are recyclable makes them very eco-friendly. It was a smart purchase on our part, due to the longevity and look of them. I customized these stainless steel tumblers for giveaways at our events. They are a great way to drum up business and be earth-conscience. We branded the steel tumblers and put them in the window at our coffee shop. Two thumbs up!! I developed a design I wanted to place on these stainless steel tumblers. I sent it to Cory at Custom Earth Promos and they took care of the rest. I received a considerable discount when ordering my eco-friendly tumblers in bulk. Very creative design team at Custom Earth Promos, they came up with a great idea for my marketing plan. I was very impressed with the customer service I received. They helped me get my design together and had my tumblers delivered in such a short time frame. I received my stainless steel tumblers and I am so impressed with the quality. 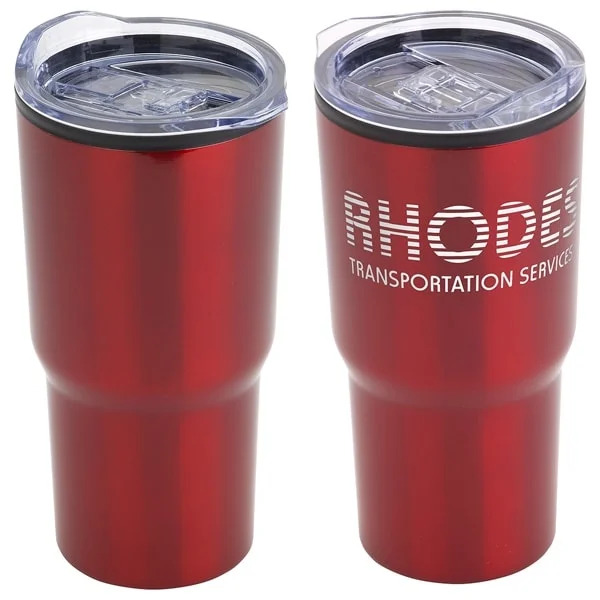 Conveniently designed to fit comfortably in most automobile cup holders, Custom Earth Promos' Wholesale Stainless Steel Tumblers are a unique blend of eco-conscious elegance and efficiency. 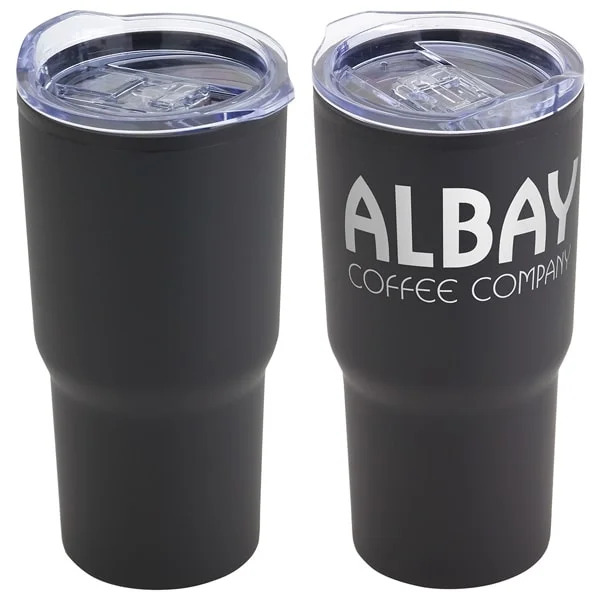 Great for on-the-go "green" customers, these eco-friendly travel tumblers will encourage your audience to reduce the excess waste and pollution caused by plastic water bottle production and disposal. Convenient for traveling, running errands and shopping, customers will be promoting your eco-friendly brand to a wide audience of their peers. Work with an in-house design expert to build a custom graphic for the 3.5" W x 2.5" H imprint area that promotes your eco-friendly initiative or current "green" campaign for an optimal eco-centric promotion. 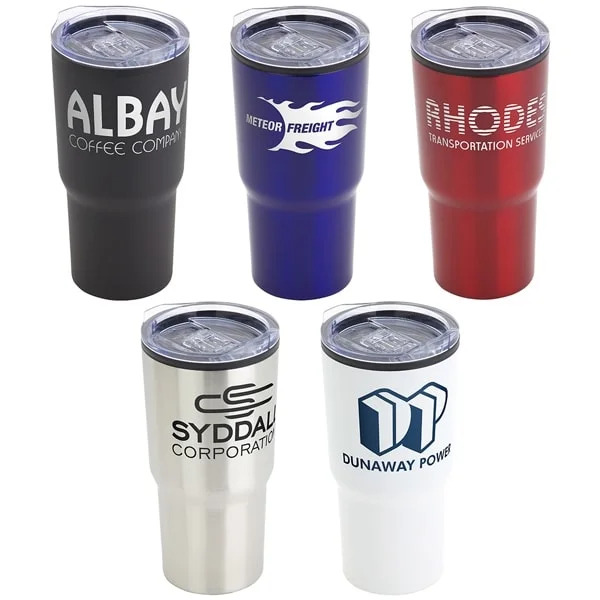 With your brand logo rendered on the smooth stainless steel outer wall and a double wall insulation to maintain beverage temperature, your customers will be promoting your brand everywhere they travel, optimizing brand exposure and establishing an eco-responsible image. Each year, 53 billion gallons of bottled water are consumed around the globe. It takes 17 million barrels of crude oil to produce that much plastic and with just 1 in 5 bottles recycled, 3 billion pounds of plastic waste are added to our landfills, lakes, rivers and oceans each year. You have the power to make a difference by setting strong standards of sustainability that will be embraced and appreciated by your customers, paying off with ROI's of increased growth, profitability, and loyalty. Green brands are reporting higher profits and market share value than less eco-responsible competitors, indicating a "Big Green Opportunity" for small, medium and large business. 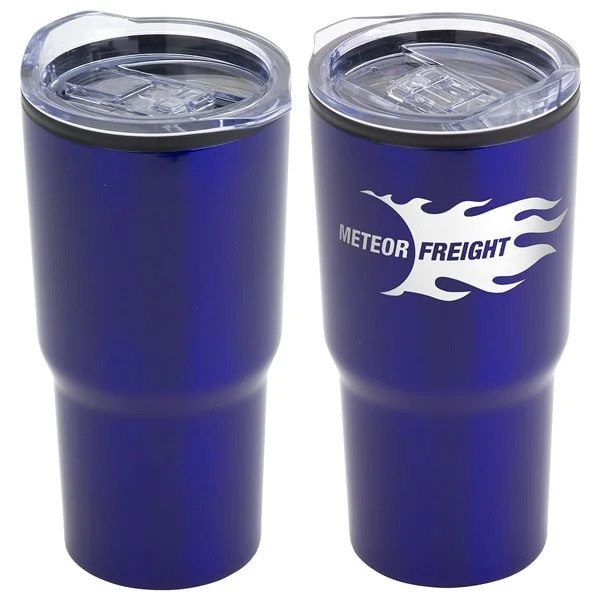 To secure success in your industry, communicate your brand's strong set of sustainable ideals and eco-friendly initiatives with eco-friendly products like recyclable Wholesale Stainless Steel Tumblers. 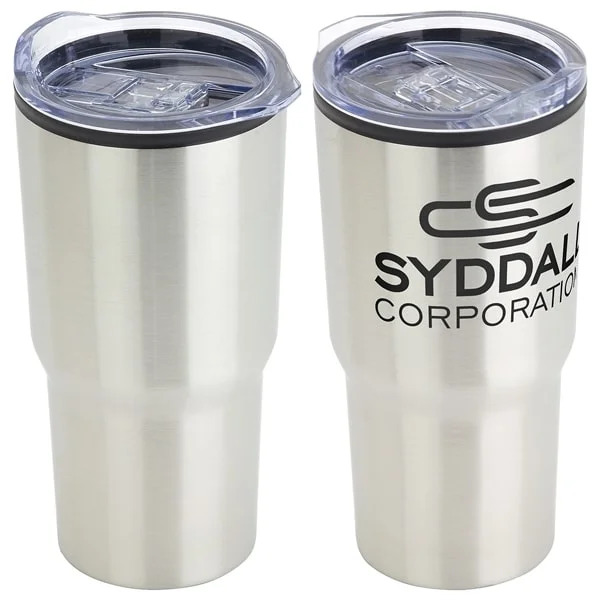 Position your business as a green industry leader by taking a commanding stance of sustainability and waste reduction with Wholesale Stainless Steel Tumblers. Ensure the safety of your customers while reducing eco-impact. Each Custom Earth Promos product is carefully tested for California Proposition 65 guideline compliance, in addition to being held to our own independent standards of quality construction. With recyclable stainless steel, our eco-friendly travel tumblers provide the perfect eco-friendly canvas to promote your eco-conscious brand. You'll work directly with a member of our in-house expert design team to build a custom order that best captures your current campaign and embodies the aesthetic of your brand. Empower your marketing efforts with environmental responsibility, undertaking tangible actions and initiatives to communicate the eco-invested ethics of your brand. Optimize your exposure for specific campaigns, networking events and trade shows with sustainable products like Wholesale Stainless Steel Tumblers that instantly add eco-friendly value to your image. We provide customers with access to a virtual spec platform, inviting you to experiment with various images and layout options for your custom imprint. Alternatively, one of our design experts can provide complete design services for you. We'll assemble your brand logo and catch phrase optimally in the 3.5" W x 2.5" H window. Whether you choose to use our virtual spec platform or have a design expert build your graphic, we will contact you for final approval of the design blueprint before moving forward with production. If time allows, we can also send you a physical sample to approve in order to guarantee your complete confidence. Our rush service caters to customers who are facing restricting deadlines, allowing us to meet your eco-friendly promotional product needs in just a few short days. Don't show up to a networking event or corporate opportunity without a memorable product that leaves a lasting, positive impression with your eco-conscious prospects. Contact us today with the details of your order and we'll get to work right away, ensuring your brand will have an eco-friendly product to build the business while benefiting the ecosystem.